For the former games between countries of the Pacific Rim, see Pacific Ocean Games. The Pacific Games (formerly known as the South Pacific Games) is a multi-sport event, much like the Olympic Games (albeit on a smaller scale), with participation exclusively from countries around the South Pacific Ocean. It is held every four years and began in 1963. The sixteenth edition of the Pacific Games will be held in Apia, Samoa during July 2019. Nine different cities in six countries and territories have hosted the Pacific Games. Three countries have hosted the games three times: Fiji (1963, 1979, 2003), New Caledonia (1966, 1987, 2011) and Papua New Guinea (1969, 1991, 2015). Samoa have hosted the games twice (1983, 2007) and will host for the third time in 2019. 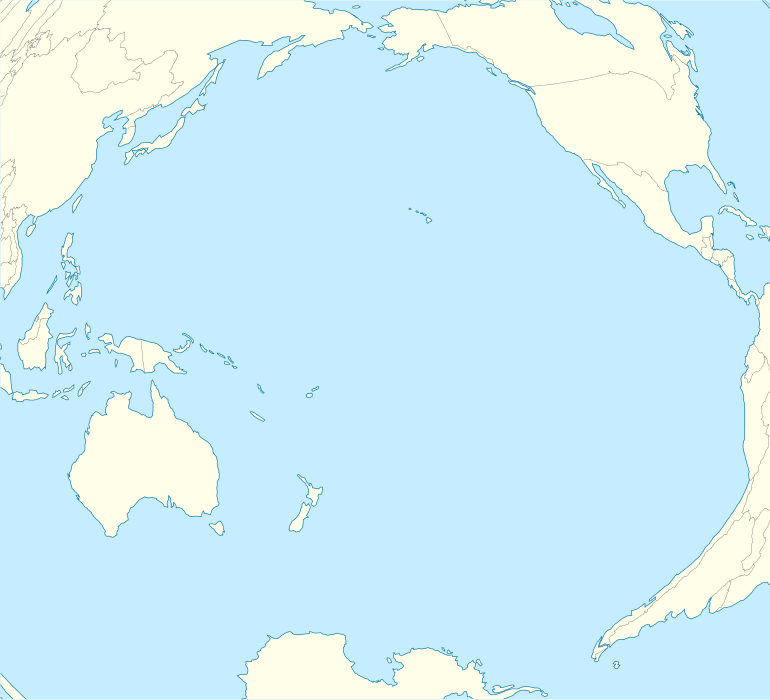 Two territories have hosted the Pacific Games twice: French Polynesia (1971, 1995) and Guam (1975, 1999). Only six countries have attended every edition of the Pacific Games: Fiji, French Polynesia (Tahiti), New Caledonia, Papua New Guinea, Tonga, and Vanuatu. New Caledonia have dominated twelve out of the fifteen Pacific Games, Papua New Guinea with two, and Fiji with one. The idea of holding the South Pacific Games originated with Dr A.H. Sahu Khan who was one of Fiji's representatives at a meeting of the South Pacific Commission held at Rabaul during 1959. The idea was adopted and led to a meeting of nine Territories, held in Nouméa during March 1961, which awarded Fiji the honour of hosting the very first Games. During 1962, the South Pacific Commission founded the South Pacific Games Council, with the first ever Games being held at Suva, Fiji. In the 40 years since, Games have been held in 12 countries and territories within the region. Initially the Games were held at three-year intervals although this was subsequently expanded to four following the Tumon Games in Guam. As a residual consequence of the European colonisation of the Pacific from the early part of the 18th Century onwards, many nations who participated in the first Games (of 1963) were under predominantly British or French territorial rule. Understandably this generated a certain amount of confusion as both British and French flags and national anthems dominated proceedings and were occasionally used together for winning countries. Western Samoa (now Samoa) was the only country with a flag and anthem of its sovereignty as it was the only participating independent island nation at that time. As time went on, fledgling nations gradually achieving sovereignty of their own sought to extricate themselves from their colonial past and new national anthems and flags emerged. Nevertheless, English and French remain the official languages of the Games. Like other sporting events, the South Pacific Games has experienced slight controversies. A minor dispute that still continues today is the scheduling of events landing on a Sunday. Throughout the Pacific, the Christian Sabbath remains very important (sporting events or similar activity are illegal in Tonga for example) and scheduling at such a time would be frowned upon. The events themselves have also been affected by religious sensitivities, notably beach volleyball where the official uniform of bikinis for women has been forced to give way to more conservative attire. However other larger nations within the region or those loosely associated with more secular states (e.g. Cook Islands (New Zealand), American Samoa (United States), and French Polynesia (France)) are more moderate in this regard. Other global and regional events have also influenced and shaped the Games' history. In 1995, the year Papeete, Tahiti hosted the Games, many countries took the decision to boycott as a direct protest at French nuclear testing in the Pacific. The Games, however, returned to near full regional participation in the following event in 1999, held on Guam. "To create bonds of kindred friendship and brotherhood amongst people of the countries of the Pacific region through sporting exchange without any distinctions as to race, religion or politics." The Games were initiated to promote and develop sport amongst the nations and peoples of the South Pacific. After fifty years in existence, The South Pacific Commission changed its name to the Pacific Community. The XII South Pacific Games held in Suva, Fiji saw for the first time the introduction of a full program of 32 sports. That program included sports that are synonymous with the Pacific region as well as sports that have a limited participation and are generally not well established. A strong corporate sponsorship package a first for the games enabled the organizers to work with a free hand towards their aims of making the games a success. A colorful and effective media and publicity campaign generated much interest and enthusiasm among the public in Fiji. Schools and youth groups were involved in interactive programs such as the adopt-a-country program also a first for the games. The XIII Pacific Games were hosted in Apia, Samoa. They were the 13th to have been held since 1963. In contrast to the Olympic Games which are expected to generate income for the host nation, the 2007 Pacific Games were expected to leave Samoa US$92million in debt, predominantly as a result of expenditure on large-scale infrastructure projects such as bridges and roads. Potential debt positions notwithstanding, five nations (Papua New Guinea, Vanuatu, Solomon Islands, Tonga and American Samoa) bid for the 2015 Pacific Games. The Games were ultimately awarded to Port Moresby, Papua New Guinea and follow the 2011 Pacific Games held in Nouméa, New Caledonia. However the rising cost (purportedly in excess of $1 billion) and the logistical burden of putting on the games continue to threaten countries' abilities to host the event. The games governing body is the Pacific Games Council. The Games council flag is presented to the host nation of the next games at the end of every games. With expansion and economic growth in the Pacific and Oceania countries of the Pacific Islands it was now appropriate for the South Pacific Games Council to modernise and revise its charter in light of these changes in the region and the changing place of Sport in our society, thus the council adapted a new charter in 2007. The current President of the Council is Vidhya Lakhan from Fiji. Membership of the Council includes internationally recognised National Multisport Organisations within countries and territories who are members of the Pacific Community. There are currently 22 members. Pitcairn Island is the only Pacific Community member that is not member of the Pacific Council, whereas Norfolk Island was admitted as a member of the Pacific Games Council although not a member of the Pacific Community. 15 members are also member associations of the Oceania National Olympic Committees (ONOC). Since the 2015 games Australia and New Zealand participate in the Pacific Games. In July 2014, the Oceania National Olympic Committees announced their members had voted to allow Australia and New Zealand to participate in four sports, on a provisional basis, in the 2015 Pacific Games. The risk of seeing the two wealthy, developed nations dominate the competition had previously prevented their inclusion. They would be allowed to send participants only in rugby sevens, sailing, taekwondo and weightlifting - sports where other Pacific countries had proved sufficiently competitive against them in the past. There are 37 sports approved by the Pacific Games Council, as at December 2017. The 2019 Pacific Games shall consist of a maximum 26 sports, but a reduction to a maximum of 24 sports will be made for 2023. The number of Pacific Games core sports was increased from 14 to 16, effective for the 2023 Games. This change was made in 2016, with Sailing and Triathlon being made core sports. The core sports are required to be included at every edition of the games. Former sports include rugby 15s (replaced by rugby 7s) and underwater fishing (last contested in 1999). Also included at the 2009 Pacific Mini Games was rugby league 7s (now replaced by rugby league 9s). ^† Football for men was a compulsory inclusion for many years but, as of the Charter revised in December 2017, it was made a core sport for both men's and women's teams. For the first time in 2007, the Pacific Games formed part of the qualification for the FIFA World Cup. ^‡ Touch rugby is an optional sport but men's, women's and mixed tournaments must be included if touch rugby is selected. ^§ Volleyball and beach volleyball disciplines have been listed as one sport for the purposes of the Games programme, since some time after the bids for the XV Games (in conjunction with the maximum number of sports being reduced from 28 to 26 for the XVI Games). Officially the final medal tally of the Games does not recognize a winner, regarding competition and fair play more highly. Australia and New Zealand were included in the all-time medal count for the first time after the 2015 Pacific Games in Port Moresby, Papua New Guinea. The table below includes all Games from 1963 to 2015. Nation(s) in italics are defunct PGAs. ^ a b c "History". Pacific Games Council Official Website. 2013. Retrieved 27 October 2015. ^ Charter 2007, p. 6. ^ a b Charter 2007, p. 4. ^ "Games puts Samoa in debt". ABC Radio Australia. 3 September 2007. Retrieved 3 September 2007. ^ Paligaru, Clement. "PNG risks losing right to host 2015 Pacific Games". ABC Radio Australia. Retrieved 22 August 2012. ^ a b "Pacific Games Council - DIRECTORY 2013" (PDF 0.4 MB). Pacific Games Council. 2013. Retrieved 27 August 2013. ^ "Vanuatu committed to 2017 Pacific Mini Games". Cook Islands News. 11 May 2017. Archived from the original on 7 October 2017. Retrieved 7 October 2017. ^ "Samoa Set To Host Pacific Games In 2019". Pacific Islands Report. 1 September 2017. Archived from the original on 2 September 2017. Retrieved 2 September 2017. ^ a b Charter 2018, p. 14–15. ^ a b c "Pacific Games: Sports Program Review". Pacific Games Council. 27 May 2016. Archived from the original on 9 February 2018. Retrieved 8 February 2018. ^ "OFC 2010 FIFA World Cup route via Asia". Oceania Football Confederation. 7 December 2006. Archived from the original on 28 April 2007. Retrieved 20 December 2006. ^ Charter 2010, pp. 15–16. ^ Charter 2012, pp. 15–16. Charter – Constitution adopted Apia, Samoa 14 May 2006 – Protocols and Regulations adopted by Executive Board on 17th January 2007 and 20th March 2007 (PDF) (Report). Pacific Games Council. 2007. Archived from the original (PDF 0.3 MB) on 28 September 2007. Retrieved 15 May 2015. Charter - Constitution, Code of Conduct, Protocols, and Regulations adopted Apia, Samoa 14 May 2006 - As amended most recently in Noumea, New Caledonia, 27 August 2010 (PDF 0.3 MB) (Report). Pacific Games Council. 2010. Retrieved 27 August 2013. Charter - Constitution, Code of Conduct, Protocols, and Regulations adopted Apia, Samoa 14 May 2006 - As amended most recently in Wallis Island, 19 October 2012 (PDF 0.3 MB) (Report). Pacific Games Council. 2012. Retrieved 27 August 2013. Charter - Constitution, Code of Conduct, Protocols, and Regulations adopted Apia, Samoa 14 May 2006 - As amended most recently in Port Moresby, Papua New Guinea, 4 July 2014 (PDF 0.3 MB) (Report). Pacific Games Council. 2014. Archived from the original on 4 March 2016. Charter - Constitution, Code of Conduct, Protocols, and Regulations adopted Apia, Samoa 14 May 2006 - As amended most recently in Port Vila, Vanuatu, 10 December 2017 (PDF 0.3 MB) (Report). Pacific Games Council. 2018. Archived from the original on 8 February 2018. Retrieved 8 February 2018.